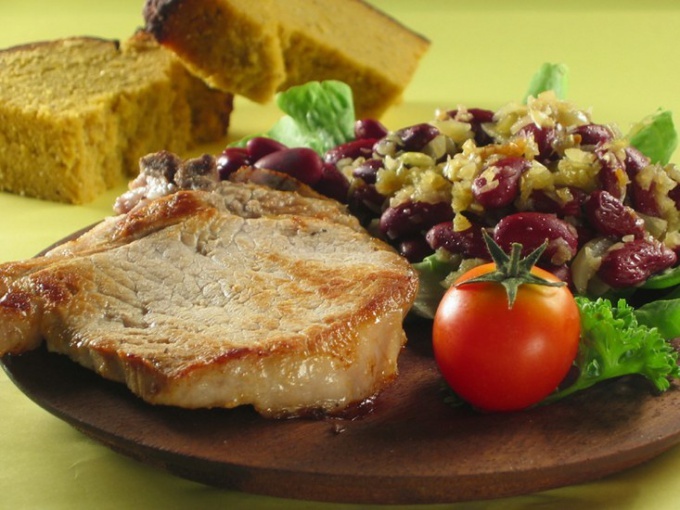 Pork chops often order in restaurants, but they are fashionable to cook at home. Try to fry them in a pan - cooked so the meat gets a delicious Golden crust, and retains the juiciness. Roasting pan is ideal boneless chops from a leg part. If you like meat on the bone, choose chops to the ribs or leg chops with the slices of kidney. Preferably light meat of uniform thickness, such pieces are better cooked through. Before cooking pork, scissors make several cuts in the fatty parts of chops. Then when frying the edges of the meat will not wrap and will not burn. To chops turned out juicy, cook it on a well-heated pan. Then coagulated by heat proteins "seal" the meat juice inside of the piece, and is formed on the surface Golden brown. Do not pierce meat with a fork and do not turn it too often. When the crust is formed, reduce heat and cook pork until fully cooked. Meat wash, dry paper towel and slice them into chops with a thickness of 3 cm, Place them between layers of cling film and beat off a wooden hammer. In a pan heat butter and vegetable oil. When the mixture starts to smoke, sear chops 1 minute on each side. Reduce the heat and cook the meat for another 10 minutes. Put pork on a dish before serving and keep warm. Turn up the heat, scrape off the stuck down bits of meat, add wine. Boil it until the volume is reduced by half. Add the cream, salt, mustard and pepper. Bring the sauce to a boil, pour over chops and serve. Fry the chops on a very hot pan, greased with vegetable oil. When pork is browned on both sides, reduce the heat and bring the meat until done. Chop the garlic, mix it with cheese, beer, parsley and mustard. Coat chops the mixture with one hand and again put into the pan. When the cheese begins to melt, remove the meat from the pan and immediately serve. As a suitable side dish French fries or green salad.